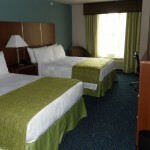 We have a total of 65 rooms available for you to choose from. Below is an overview of each room. Our hotel is a non-smoking facility. 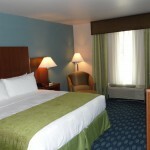 King Feature with Hot Tub in Room – This is our premium room that includes a jacuzzi hot tub in the room. 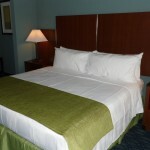 King Standard with shower – This is one of the optional King Bed rooms that includes a shower. King Standard with tub – This is one of the optional King Bed rooms that includes a full bathtub. Studio King with Shower – This is one of the optional Studio King Bed rooms that includes a shower. Studio King with Tub- This is one of the optional Studio King Bed rooms that includes a bathtub. 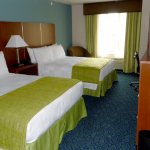 Two Queen ADA – This is one of the Two Queen Bed rooms that is handicap accessible and includes a bathtub. 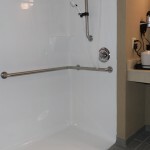 Two Queen ADA w/Roll in Shower – This is one of the Two Queen Bed rooms that is handicap accessible and includes a roll in shower. 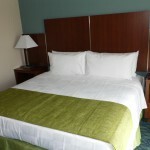 Two Queen with Shower – This is one of the Two Queen Bed rooms that includes a shower. Two Queen with Tub – This is one of the Two Queen Bed rooms that includes a bathtub. 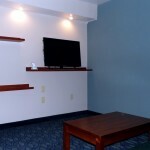 Executive King Suite – This is one of the optional Executive King Suites that includes a separate living area. 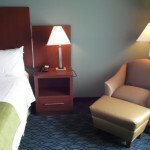 Executive Queen Suite – This is one of the optional Executive Queen Suites that includes a separate living area.